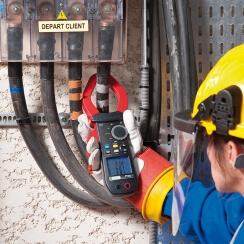 With protection against electric shocks up to 12 kV, the F600 Series fulfils the most demanding safety criteria (CAT IV 1,000 V) and offers a high protection rating allowing users to work in total safety on all LV installations. The F600 Series is ideal for high-power applications such as electrical power distribution, chemical and petrochemical industries, metallurgy, rail transport, etc. 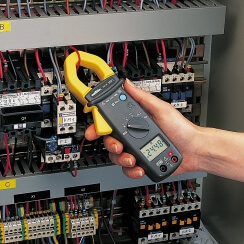 With all the essential functions (AC and DC voltage, AC current, resistance, frequency and continuity), the MX 350 multimeter clamp is easy to grip and has a particularly readable display. It enables the frequency to be measured for current (up to 10 kHz) and voltage (up to 1 MHz).